Blending modern design with retro flair, the Type 11 Prototype Two from London bespoke motorcycle shop Auto Fabrica gives the Yamaha XSR900 a new identity. This feature Type 11 Prototype Two by London’s Auto Fabrica appeared first on TractionLife.com by Amee Reehal. Dubbed as the world’s first flying motorcycle, we’re not sure what to make of the $380,000 Jetpack Speeder by the US-based Jetpack Aviation. This feature Jetpack Speeder Flying Motorcycle appeared first on TractionLife.com by Gear Editor. Not your typical twin-cylinder Ducati sports bike, the Northamptonshire-based Wreckless H4MM4 Ducati Speedway motorcycle is definitely a rare machine. This feature Ducati Speedway Motorcycle by UK-Based Wreckless appeared first on TractionLife.com by News Editor. This feature V4 Penta: A Limited-Edition Ducati Panigale V4 by Officine GP Design appeared first on TractionLife.com by News Editor. This feature 5 New Motorcycles We Liked in 2018 appeared first on TractionLife.com by Gear Editor. Norton Motorcycles debuted two stunning 2019 modern scramblers harkening back to iconic bike builder’s past. 2019 Ranger & Nomad are on sale now. This feature Norton Drops a Pair of Gorgeous 2019 Neo-Naked Modern Scramblers appeared first on TractionLife.com by Dustin Woods. This feature Indian Motorcycle Unveils New FTR 1200 Models Before Intermot Show appeared first on TractionLife.com by Dustin Woods. Special Edition Ducati Limited to 500 Units. To commemorate, the Italian motorcycle brand unveils the 2018 Monster 1200 25° Anniversario. This post 25th Anniversary 2018 Ducati Monster 1200 Announced appeared first on TractionLife.com by Dustin Woods. When the e-mail from BMW first hit my inbox, I thought BMW was releasing some pictures of a new concept convertible but when I opened up the images I was surprised to see there was no convertible at all. 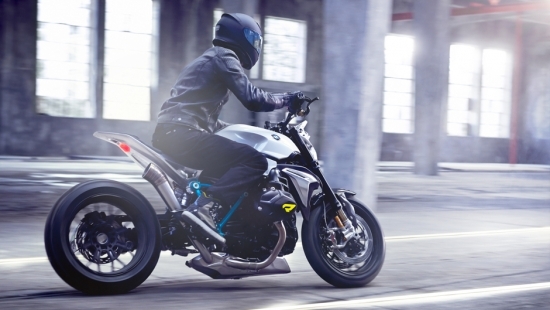 The BMW Concept Roadster is in fact a motorcycle, a mighty fine looking motorcycle at that. It is powered by a 2-cylinder boxer engine mounted upon a light tubular space frame. It generates 125 horsepower at 7750 rpm and delivers a maximum 92 lb-ft of torque at 6500 rpm sans chain, instead utilizing a drive shaft to the rear wheel. “The BMW Concept Roadster is exciting to look and at least as exciting to ride,” says Ola Stenegard, Head of Vehicle Design BMW Motorrad, of the BMW Concept Roadster. I definitely agree with Ola Stenegard. From the carbon fiber parts to the titanium single center exhaust and milled aluminum rear end the BMW Concept Roadster is certainly a looker. Powered by LED lighting behind a matted diffuser, the headlamp looks like something out of a science fiction movie. It probably doesn’t work very well in the real world but not to worry, it likely won’t ever hit the road and if it does would likely get a standard set of LED projectors. Lot more images in the gallery including many pictures from the design process, check it out.